Rented House and Vastu Shastra: (Before reading this content, please read House vastu) Rent or payment for the temporary use of a property or hiring with an agreement to stay for a short time. The agreement may be in between landlord and tenant for monthly or yearly regular payments for the use of such property, temporary dwelling by paying some costs. In some areas, the renting, hiring, lease, agreement etc may be used as different words as per their local understanding methods, ever since the system, it may be temporary. In some areas, there is another system is also there, no rent, no interest for the advance payment, for example the tenant pays Rs.10,00,000/- as an advance to the property owner, for this no charge or rent for the said property. In some areas, the tenants are acting as landlords and landlords are rounding the court of law to vacate them, very nice system. Many residents asking / enquiring us for the results of a rented property Vastu. 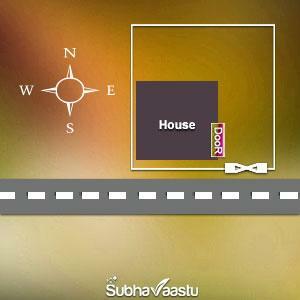 Some asking about vastu remedies for rented house. Please always remember one point here, if you are taking the property for rent, first check how many years you are planning to stay there. If you are planning to stay there for 6 months or one year, then don't check vasthu and if the property is nice and meets your requirement then join that property. If you are planning for more than 2 or 3 years, then it is advisable to have one expert vastu consultant help and get his recommendations. Generally, Vastu Shastra experts take more money, so you should also check the value of what you are spending money for that rented property. We came across some properties which are two lac rupees (INR) as rent for a home, its true, it happened in Bangalore, Hyderabad, Mumbai, this Rs.2,00,000/- is for monthly rent. For them its suggested to have only vastu specialist help. If a specialist Vaastu consultant came to that property he can guide you the facts of that property, then you may further decide to take that property for rent or not. Generally, Vasthu consultant guide you the most critical issues in those homes, vastu consultant may not be pointed on small irregular Vaasthu shastra issues, because you are taking the property on rent. Vastu consultant generally asks some questions to inhabitants in his consultancy to know whether you are buying that property or taking for lease. Based on your answer vastu consultant may pointed out the high priority and medium priority irregular Vaastu defects/issues on that property. Sometimes vastu consultant never pay attention on medium priority issues on rented properties. If he objects for even for a small vastu irregular things, you may not get a house for rent, though you searched for two years. Its true and you are aware of this fact. But the same vastu specialist is pointed on each low priority issues when you want to buy, this is the system many vaasthu expert consultants are doing in society. Based on many situations, generally, the most expert vastu pandits are taking decisions. Sometimes they are very serious on a small vastu defect but in some time they won't care for medium vastu defects. Many thought that rented means only houses, but there are many properties are available for rent for example : factories or industries, Hotel, lodge, restaurant, lounge, rest houses, shops, houses, car or two wheeler stands, hospitals, offices, choultry, cinema theaters/movie lands, fun club, Jim and fitness center, bar and restaurants, colleges, schools, educational institutions, Nursing homes, clinic, Hospitals, Bank Building, warehouses/godowns etc. For East facing or East road access should be Northeast-east, next best is East for their outbuilding. For West facing or West road mall the entrance should be Northwest-west, next best is West. For South facing or South road the best entrance is Southeast, next best is South. Not advisable or negative entrances are Northwest-north, exact Northwest, Southeast-east, exact Southeast, Southwest-south, exact Southwest, Southwest-west. We never recommend corner entrance doors, except Northeast corner that to under some terms or conditions. This is a property, where newly built, its a beautiful one and monthly rent of Rs.75,000/- INR, this was situated in Bangalore city. 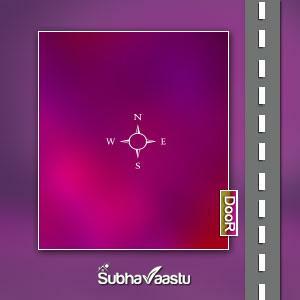 When tenants want to take lease this property, his wife asked to show this property with one expert vastu consultant. After visiting the property, he was suggested not to take rent of this property. Husband never hear these recommendations and was forcibly joined the property and within a span of one year, he, himself requested the same vastu consultant to visit the property once again. Why? This is elegant and fashionable/posh property. The tenant is also having status in society and occupying the highest socioeconomic position in the society, he never wants to compromise, because of his business is like that way. All of his clients were very costly and may use to visit the house regularly to settle many deals. We should note one point if there is no North for the property and there is a road at West, South, and East, it's not recommended. Observe carefully, "House" shown with near to the West road property was for rent. One of the famous doctor would like to take this property in Cochin, Kerala state (city name changed) and shown for vastu evaluation. The consultant visited the property and pointed two important negative things here, one is Southeast-east street focus and South vacant land. Both may damage and powered with negative force to the house. 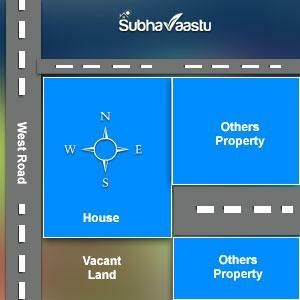 If you would like to take this property for a period of only 3 to 4 months then no need to check vasthu. If you plan to take for a long term like years together then compulsory or definitely you should check for vastu compliance. It is recommended thought. This residence is having North road. Wide range of open space towards West direction, the home was constructed towards East direction, leaving a space of only 2 feet, West is having more than 50 feet open space, it covers with lawn, excellent landscaping its a very beautiful house. By seeing all these orderly grouped, the politician bent and was taken on lease, it was happen in the state of Maharashtra. He faced very difficult situations in his career / field, for a smaller things also used great physical or mental effort to accomplish or endure /comprehend power to controlling influence to withdraw others on his path, even for a smaller things also used high and heavier force. We never wish to publish some more negative impacts which he was faced in this property. Please note that Politicians require good East open space in their living properties. Wide West open space may damage their influence and career. Observe the this property: Industrialist faced displeasure situations and continuation of labour interruptions, agitations and many more problems. 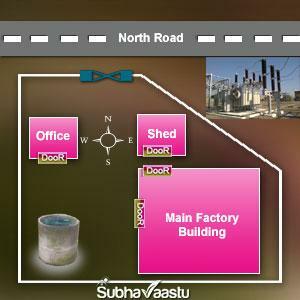 Within a period of 11 months, the Industrialist searching for a renowned and famous vastu consultant in India for his newly rented factory. The ill fortune is, he was taken this property recommended by one so called vasthu specialist, who served Talisman, which magically protects against evil and negative forces and was collected Rs.1,50,000/- and other expenditures about Rs. 12,000/- and was charged only Rs.1000/- for vaasthu consultancy services. Poor Industrialist was in his spider trap and was paid whatever he demands and performed some reverent prayers also there. The trinket or piece of jewelry usually hung about the neck was removed and thrown outside after knowing that he was cheated by quack. Before taking this property, with great efforts the Industrialist was arranged money without any second thought and with many hopes he was entered here and lost many valuables including time. The bad effects of the property with a short note. Northeast truncated property which may not be good, always creates issues, may not observe the development there. The main factory building was constructed towards Southeast and leaving empty space towards Southwest, this may leads to always disturbances in their fields. Sometimes for a smaller work also they has to use higher resources to solve the issues. Agitations, complaints, machinery repairs may be heavier. Southwest water source/well, which may damage everything, even reputation may also spoil. Northwest entrance gate, which always brings negative energy into the property. The Office was situated at Northwest to the entire property and frequent walks were observed to the main factory building and office. There is a 40 feet space in between main industry building and Shed which was shown in the above image, so you may imagine the other measurements of the entire premises. Some Properties to be avoided. This property is having main entrance door towards Southeast-east direction. Avoid to take rent these properties. For short term, no problem, for long term, not advisable to have these properties. If the property is having Northeast-east door, then it is considered to be auspicious. You are planning to take the home for rent for a period of 10 years then observe the East is elevated or depressed, if the Eastern portion is more elevated, the head of the family would suffer from poverty and their progeny may suffer from chronic illness (head of the family or bread winner may be experience pains or feels unpleasant here) or they may become mentally retarded, this is counted only if the door is towards East or Eastern Northeast only. It is generally observed that in mega cities in India like Mumbai, New Delhi, Kolkatta, Chennai, Hyderabad, Bangalore, Pune etc many are constructing business establishments in Southern Southwest parts, with the road towards South. They are entering into the house or the shop through Southern Southeast entrance as they have sold out or hired out the above shop. Similarly, when there is a road in West, the shops are built in West or Western south west and sold or hired out to others. So in such phenomenon they are entering the house or shop through Western northwest entrance. It is but natural then that Southwest has cut off to the road on South or West. Even then, are the inhabitants not happy? hence, we opined, that the authors of the books, should have some personal experience before commenting on effects of Southwest, truncate and so on. Question : Good afternoon Sir, Happy Maha Shivarathri. I am Swapna here from Bangalore, Karnataka. I have a vaastu doubt to ask you. The South-west corner of my house is having wardrobes at west wall and big window on south wall. Is this bad?? I want to keep locker at southwest, where I have to place?? Inside the wardrobe or outside?? I am facing financial problems very much. And people say vaasthu is not applicable for rented house. Is it true?? Vastu applicable for rented houses also, its no doubt, period of stay is important as discussed above. Wardrobes towards West wall is good, having doubt on big window at South, you have not mentioned about surroundings information particularly towards South direction. If South is having constructions then you may use that window, if no constructions towards South side and very bigger open area at that direction then its recommended to close the South big window. For all of your problems, its better to show your property with one expert vastu consultant to have right recommendations. You are well aware of the fact that taking a property on lease means it may not be very longer period, it may be short period, now we are dividing this issue into two parts one is short period and second one is long period. 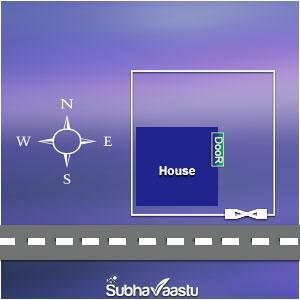 If your plan is to have only short term arrangement, then it is recommended that don't check vastu of the property. Let us discuss what is the Short term and what is the long term here. A period of 3 months to 6 months is called as short term and more than 6 months is called as long term here. The particular period of agreement time is important for the changes. In most of the cases the results whether they are bad or good starts only after 6 months. Generally, our elders says that we should wait for atleast one year to check the results of the property. This one year period includes Uttarayana and Dakshinayana and also across four seasons in one year period. Based on all these conditions, one should not check the results of a property within a period of 3 to 6 months, when can we get 100% perfect time of results (either bad or good), it's only based on surroundings of the property. Now check the below property. This house is having Southwest street focus and it has Southwest-south gate and Southern Southwest door. The entire house was constructed towards Northeast and due to this there is a open space towards Southwest, South and West directions. If you found this kind of property then it should be seriously think twice before taking such a property. So we should learnt some new things that some properties are there they may not be suitable even for the short term commitments also. In the above para content what did we discussed, no need to check vastu for a property if planning to take for short period, now what did written here, this is what the serious impact from surroundings and internal vastu effects and this may cause threatening and great harm to the residents. Please note that for a certain period this property may provides good results, based on that the tenants may decides to continue here, that should be the wrong idea. Now check the below property. Almost same property but some changes has to be observed here. Please observe this image and above image carefully. Almost same property when compare with above one, but it does not have Southwest street focus and Southwest gate, the remaining every thing was same. If you are seriously looking for a rented property and that to a short term then you may join with this property. PLEASE NOTE THAT, we are not recommending this property even for the short term, but this may be the good one when compare with the above. Hope you have understand what did the meaning plays here. In your searches if you found both above two properties and there is no way for any other good property and you don't have time for new search, then you are advised to take this property only, not the above one. Read this line also, this property is not at all good for the "LONG TERM", hope you have clearly understand this logic here. If not please try to again read another time for good understanding. House was constructed towards Southwest, main gate was placed towards Southwest, South road, more space towards North and East directions. Only issue was Southeast main door. It may harm for the Long Term Period people. This may be suitable for the Short Term Period People. Observe the below image for more information. This home has Northeast-east main door, main gate was came towards Southeast, South road and more open space towards North and East parts. This type of properties are good for the Long Term and Short Term Periods. Please note that we have given only some examples, don't take these examples as the final options and don't enter into agreement or contract based on these images. 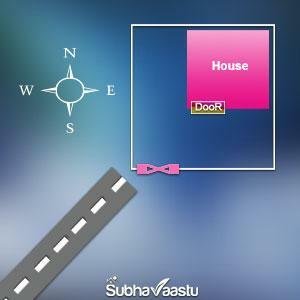 Some body asking doubts that no need to check vastu for rented houses or Vastu is not working for rent properties. To clarify their questions we published some inquiries with changing of names below. We have already sent clear answers individually. Due to some limitations, we did not expose same here to protect our website visitors privacy. The object of publishing questions here is, whether vastu shastra applies for rented properties or not. We received almost thousands of enquiries only on letting out properties. After completion of reading below, hope you may understand the significance of Vaastu Shastra even for lease or rent properties. If you require we will publish another 500 questions here. Then you may understand the importance of Vasthu working for rented properties. 1. 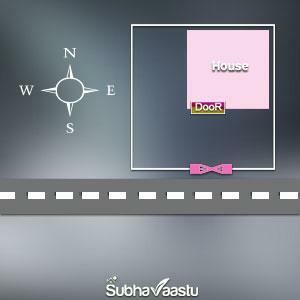 Hi Suresh Avure, I'm a vaasthu learner and we are moving to new rented house, so our query is the house has road on the both side south and north and house constructed up to 4 floors and each floor has 4 houses in which I'm renting one portion..but the house has bore-well in south west corner.so my query is does it effects all tenants in the house or the only guy who stays in that south west portion or the house owner who stays in first floor.. sometimes i think i should worry about vaasthu for the portion for which i'm paying rent.. Please revert with your valuable suggestion. My advance thanks for your time. Thanks - Nataraja, Bangalore, Karnataka, India. 2. Sir, i am working in air force. i have a South-West plot and i intend to register a house plan for approval. Can I have a plan for this S.W plot to build 2 houses so that one can be given for rent. thank you - Srinivas - Mumbai - Maharastra. 3. Dear Sir, My star is Maham (Simha rasi), my wife star is Tiruvonam (Maharam Rasi). We have a land in my wife name.. Total area is 60 X 90 feet. But we reserve for 30 x 90 for own house in future. In the other 30 x 90 We want to build line houses north facing ( 4 Nos. but one home for me other 3 houses for rental purposes) in my own land with bank loan facility. Can I provide each hose FOR 20 x 26 FEET. As per manayadi sastram, which size is correct for one house. Can I get loan facility with bank. Please advise me. Thanks - Saravanan - Chennai - Tamil Nadu - India. 4. Hello, We are thinking of renting a flat. The house door faces north west (leaning more towards north. There is a flat that is opposite to this. There is a north facing road and another apartment across this. Kindly advise - Surya Karthik. 5. Good afternoon Sir, Happy Maha Shivarathri. I am Swarupa Santhosh here from Bangalore. I have a vastu doubt to ask you. The South-west corner of my house is having wardrobes at west wall and big window on south wall. Is this bad?? I want to keep locker at southwest, where I have to place?? Inside the wardrobe or outside?? I am facing financial problems very much. And people say vastu is not applicable for rented house. Is it true?? Kindly reply me back - Roopa Narendra - Bangalore. 7. Dear Sir, We have recently shifted to rented house, i found that their is a lemon tree in the house. according to vastu is it ok or not. the tree is in south - east direction. Kindly suggest Thanking you - Rajesh - Chittoor - Andhra Pradesh. 8. Firstly i would like to thank you for all the good work and information. my question is- i live in a rented house with North facing Door. Its in third floor. Bit of the west side is missing (South west is there), it is used as stairs (outside). and again North west is the toilet. when i enter the house, i have to cross toilet/ bathroom and then the Main Door. so advise me the adverse effects. Thank you in advance - Prashantha kumar - Hyderabad - Andhra Pradesh. 9. Hello sir, my question is we r staying at rent & our house entrence is facing north directionin 3rd flr, we have stair case on our right side of the door for terrace , can we keep the gods photos i the north wall and secondly i have place my tv shelf in the north east cornear is i ok and gods temple in west direction facing towards east but next to the main dooris it ok,pls. guide me - Kavitha - Mumbai - Maharastra. 10. Hi i just wanted to know the charges for doing the vaastu for my rented shop . I sell ladies dress materials in vasai .mumbai .just started it in dec . 2013 so was wanting to enhance the positivity for good sales and profits. Kindly let me know the same - Nelson. 11. Hi, We are planning to rent a bakery space for a Restaurant. We are trying to renovate. Main Entrance is facing West ( this is inside a complex) Has a Northeast door in the back. Rest rooms are located towards North east side, not sure where the rest rooms should be. Need the advice where the Coolers should be( The walk in coolers are located at SouthEast Corner) - Chelsia Robert - Dallas - United States of America. 12. Dear sir, I need to know of my rented shop vasthu which has facing towards west and my rasi is Scorpio,Nakshatra-Anusham-2.my rented shop size is length - 16" and breath - 8". I don't having any improvement in financially and business also. Kindly suggest to solve the problem and to grow up with well settle. Narayana Raju - City and Country not known. 13. Please, help me, my kitchen is SW, i m facing SW while cooking, my sink it s on the corner of W and the stove on the SW,the paint it s allready yellow, please give me some remedies, i m not landlord, i can t brake anything, thanks a lot - Stef Mary - New Jersey - USA. 14. Dear Mr. Suresh, We are staying in a rented flat and I am trying to buy a flat for ourselves. However I try to save there is some problem or the other. I would like to give you descriptions of this house were we are staying. We are staying in Thane which is close to Mumbai. The main door is facing the East. As soon as we enter is the Living Room, followed by Kitchen, Common Toilet and then the Bedroom with attached Bathroom. In the Kitchen the platform is situated in the South and the sink is in the West. The Bedroom’s Toilet is on the East and the Landlady has a Cupboard which is in the South and cannot be removed. We have a Chestnut Bureau which is situated in the North. Also we have some ailments in this house. We request you if there is any solution that can improve our Finance and health issues - Rajasekhar, Place and Country not known. 15. We live in flat facing east.kitchen on n.e side.rented flat.there is servants toilet in n.e side.bedrooms are on n.e,s.w and north west side.3 bedrooms.facing financial problems,business problems.son in 12th std,doing board exams in march.pls help - Savitha - Cochin - Kerala. 16. Hello Mr.Suresh, Happy New Year to you !!! We are a Indian sweets and desserts manufacturing Company based in London. I just wanted to have a few tips about vaastu for the kitchen and other areas. Is there any remedy if we cannot follow the vaastu as we have a rental premises and many changes cannot be made to the structure. I have attached a map of the site for your perusal. Please respond with your suggestion. Kind Regards, Bala Sekhar - London - United Kingdom. 17. I am in a very bad position.my date of birth is 3-2-1960.time 11.30pm place nilgiri district,tamilnadu. I was working for many good company in sr.position. from aug 2013 I have started my own buissnes. I have rented office and I have shifted my residence also in office. front room iam using as office.the office entrance is south west. my sitting is in south west facing north east. pl sugest me if you can help me - Showkath maqbool - Raipur - Chhattisgarh. 19. Dear Sir, I have a toilet on the south west corner of the office. this is rented office so i cant change the same so what is the remedy for the same. I am suffering with many problems - Sagar Marthand. 20. Dear Sir, Your website present design is very fine. However, I have a doubt in my mind regarding which direction suits me. Presently I am residing in an apartment with six floors with four flats on each floor. My main door facing North direction. East is blocked by another flat West is blocked by another flat In front of South and North sides are blocked by two big apartments There is no Sun or Moon visible at anytime. Eversince I occupied this rented house I have become bankrupt /cheated in financial matters, debts are mounting, Daughter's marriage delayed, Son not yet secured job. I am sleepless and worried whenever I stay inside the house. Kindly advise me which direction I should select if I have to shift from this house. Please state clearly which direction I shall be going when I step out from house. I did not get proper advice locally. Kindly help me and oblige - Naga Rajarao. 21. Dear Sir from last one month every day i am facing a new health problem and now problems are turning to worst. Sombody told me i have to change house because according to vastu this house is creating more health problem in me. I am staying in rented house this is last house in close street. Actually, earlier street was open but because of some issues few person has closed that one. Kindly help me - Miss Verma - Azamgarh - Uttar Pradesh - India. Now a days selecting a right property is very difficult. So, for short term requirement, try to find out atleast minimum basic things. For Long term commitments, try to find out good vaasthu properties. Question : I'm a vaasthu learner and we are moving to new rented house, so our query is the house has road on the both side south and north and house constructed up to 4 floors and each floor has 4 houses in which I'm renting one portion..but the house has bore-well in south west corner.so my query is does it effects all tenants in the house or the only guy who stays in that south west portion or the house owner who stays in first floor - Ramachandra - Bangalore - Karnataka - India. Answer by our Team : Attachment or connection with the property is most important in Vastu shastra. The second point is Time. So a Vastu shastri should first examine the Time frame where the inhabitant was occupied a property and the attachment with the property if the resident is partially using one portion. Based on this features and also should observe the vastu inside and has to observe the surroundings effects on the property. Vastu shastra was written only on independent properties, we don't have collection where rushis were written vastu on apartments or flats, recently many experts in this field has researched many things on apartment flats and found many facts and also drawn some important significant useful facts to the society. If you are not occupied the ground floor of such apartment, then no need to worry at all. If you are occupying the first floor and residing at Northeast or other than the Southwest portion, then also no need to worry, if you are living towards Southwest portion exactly on top of this well, and if your flat owner accepts then you might just lift some heavy weight material towards Southwest corner to reduce any bad effect if that's the case. At first we should learn one thing while coming to the flats and apartment system. What ever the effects to the apartment then most of the flat owners/ occupants might face such situations, not individually but altogether. There are many doubts also raised in this question and in all of our examinations while with flats vastu. We will discuss every thing later. At present there is no need to worry in any case. We are staying in central part of New Delhi, would like to vacate the present home and wish to take a new property on rent. Can you please be share a thought which direction we should move from our present home. Some body saying that we should more only towards Northeast/East/North only, is it right, please guide us. Answer by our Team : No doubt moving towards Northeast/East/North may be good, but in all cases its not at all possible to move such way. Because, if you are already moved towards Northeast, then where you have to move, can you vacate city and move towards Ghaziabad?, after where you have to move Modinagar or Meerut or Nepal or Tibet or China? One person by Akshith Patel, who is doing vastu consultant practice and stay in the rented home in Hauz Khas, present house owner asked him to vacate the property as his son is coming from USA and staying there for 6 months. So Akshith Patel thought to vacate the property and he wish to move only towards Northeast, i., Lajpat Nagar and taken one home and later on he has to vacant on some personal reasons and moved towards Jangpura, after some months owner needs to modify the property and requesting him to vacate the property, so Akshith Patel should move only towards Northeast, shall he move to Yamuna River and die there. All these are funny things. You may move to any where in your town or city. 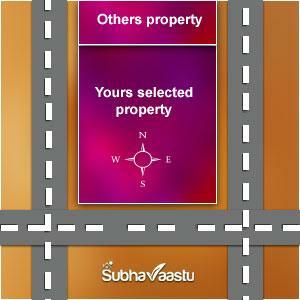 But you should take only the perfect vastu property. Then your life will be colourful, otherwise, you may suffer where ever you go. In general always search to select a home at Southwest of your city or town and with this your office or shop or commercial place will come only towards North, East or Northeast. Regularly you are moving towards such places so you will be little benefited. All residents who occupied Southwest may not be life long richer and all residents who occupied Northeast may not be life long poorer. Both statements are wrong. Only littte percentage is more beter for Southwest occupants. We are presently living in 12th floor in an apartment, now we want to move from this flat and we seen one apartment flat, we liked a home in 4th floor, somebody says that we should not come down than this 12th floor to 4th floor, is it right? Answer by our Team : These doubts are not worth to believe. 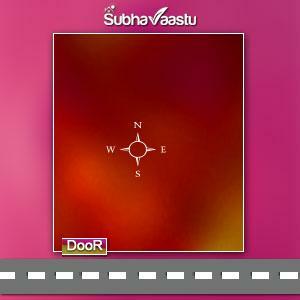 You may either select 4th or 14th floor, but it should be good in vastu. 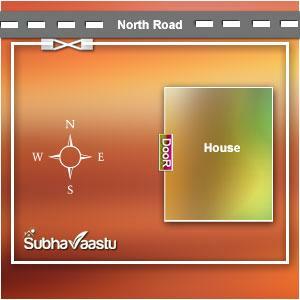 If residents likes to know more information on vastu shastra, please do write one email, we will respond them asap. Below you can find the contact us page. Thanks in Advance. In which direction Tijori may keep in shop? What are the best tips for windows placement? Vastu consultant in Houston, how to contact them? Show me some Vaasthu Shastra tips for Water Sump? How to decide Gomukhi sites and Shermukhi sites, need info? dear sir pls. let me know the rented flat main facing which on is good,i saw flat entrance was North West? let me know if u have contact details. i am planning to shift to banglore with family , looking for the rented house for atleast next 3 yrs. can you please tel me the basic things that we need to take in consideration while renting a house. Hey nice post dude!!! it is really helpful for the buyers who are looking for vastu properties in Hyderabad properties and in Bangalore properties etc. Nice Post!! Hyderabad is also one the best places in India for residence and business. Hence, Hyderabad could the right choice for property investment. If anyone is looking for Properties in Hyderabad .From where you can find best properties that are matching with your requirements. I had heard that in pregnancy they dont use to vacant rented house so sir please tell me weather I have to vacant rented house are not is there any harm as per vastu. Which things is taken first when we shifting to the rented house? I liked your blog, very detailed. I have a query for rental flat. My date of birth is 5/5/1954, I am shifting to a rental flat which has living room in North and balcony, main entrance is at West side of living room. Kitchen in East and south has master bedroom and west is 2nd bedroom. Flat no. is 701/702. The directions in the flat are on all four corners for eg. Entrance is North west and master bedroom is in south corner hence it is south east. Behind the building there is a school and hospital and open space in south east. Where as North has buildings ahead. Please let me know if this flat is ok foe me. dear sir, can you visit kerala, pls inform me your next visit, i would like to show one property which we plan to buy shortly, i am coming to india in next month, will cal u when i left Kuwait. I salute for your services, you are not leaving even the rented properties also, ordinary human being or a layman also can easily find out the mistakes and what important steps has to taken before occupying the leased ones. Thank you dear, thanks a lot for your maturity in serving society. great services. I'm extremely inspired along with your writing skills and also with the layout in your weblog. Is that this a paid subject matter or did you modify it your self? Anyway keep up the nice quality writing, it is rare to peer a nice blog like this one these days.